It’s never been easier to build your event schedule around your specific business goals. Choose from 75+ innovative sessions—including keynotes, hands-on labs, workshops and interactive presentations—you can focus on the topics that matter most to you—and walk away with everything you need to achieve unlimited growth. End of support is coming for two commonly deployed server products, SQL Server and Windows Server 2008. Now is the ideal time to help your customers upgrade, modernize, and transform to current versions of SQL Server, Windows Server, and Azure services for more security, performance, and innovation. Join our exclusive Microsoft pre-day event to learn about how you can help your customers upgrade and adopt the innovative technologies they need to carry their organization into the future. Join us at the Get Connected event to hear 2019 predictions and insights from a leading analyst, learn tips and best practices to leveraging Connect and Ingram Micro’s channel ecosystem, networking with cutting-edge ISVs joining the Ingram Micro Cloud Marketplace, and have an opportunity to judge ISV pitches in the Shark Tank competition. Join us on at the Women in Cloud event as we honor past successes and embrace future challenges in a positive, upbeat environment. Enjoy delicious afternoon snacks and a champagne toast in a beautiful area overlooking the San Diego waterfront. The Welcome Reception is the perfect opportunity to kick off Ingram Micro Cloud Summit with food, drinks, and networking by the waterfront. Having been one of the first companies to recognize the cloud’s full potential, Ingram Micro has been leading the charge ever since. Drawing upon the company’s 10 years of thought leadership in a number of critical areas, Nimesh will discuss why it’s essential to have the right partners and will introduce several initiatives designed to help you get ready for success, focus your efforts and accelerate your business at the speed of opportunity. The Power of Partnership: Gavriella Schuster, Corporate Vice President for Microsoft’s Commercial Partner organization, discusses the evolutionary partnership of Microsoft and Ingram Micro, and how we are powering the ever-changing needs of customers. When powering the growth of leading companies throughout the world, it’s imperative to foresee future industry trends, and more importantly, understand how to benefit from them. Hear David talk about emerging technologies and how businesses are taking full advantage of these opportunities by leveraging CloudBlue’s hyperscale platform, infinite ecosystem and acceleration services. Companies are choosing multiple clouds and cloud providers to best meet their needs. And, they’re integrating those clouds with existing IT to get more value. The result is a hybrid approach to a multicloud environment. Steve will discuss this marketplace shift and how IBM is taking an open approach to help organizations create cloud-native business applications faster and drive greater portability and security of data and applications across the cloud—all with consistent management. Join Scott as he reveals the top three winners of the Comet Competition, a challenge created in partnership with Ingram Micro that’s dedicated to discovering the world’s most promising early-stage startups and funding their trajectory to channel market success. As we explore the future of cloud computing, it’s evident we’re just seeing the tip of the iceberg. Peter explains the promise of edge computing, the valuable strategic advantage behind it and how businesses can adapt more quickly and efficiently to the shifts that come with the natural evolution of cloud. Free-solo rock climbing is not a hobby for the spontaneous adventurer. After all, when climbing 3,000 feet above the ground without ropes, one small mistake can cost your life. As the star of Free Solo—this year’s Oscar-winning film that documented his efforts to scale El Capitan—Alex will discuss how extensive preparation, extreme focus and total commitment can help turn a calculated risk into mind-blowing success. Learn a step-by-step strategic process to methodically market to, present and close business with your existing clients as well as keep your pipeline full quarter after quarter. Acquire effective techniques you can leverage to boost existing client sales by 40% or more. Ingram Micro Financial Solutions has the financial tools and resources partners need to expand their cloud practice. Learn about navigating your credit line, building your as-a-service offering, better managing your cash flow as you pivot to monthly recurring revenue and more. The Cloud Marketplace is designed to support and advance you on your cloud journey. Learn about its newest features and functionalities, the new unified control panel, and other updates coming down the pike that will give you more capabilities and more control. CloudBlue is a leading commerce engine with a developed hyperscale digital platform, access to an infinite ecosystem and proven go-to-market services. Learn how this platform helps partners adapt, compete and grow by enabling speed to market and revenue for digital services. Chances are you’ve heard of the IoT revolution. Promises of a smarter, more connected world for businesses of all shapes and sizes. But have you ever actually sold or deployed an IoT solution? In this session, we’ll demonstrate how Ingram can help you realize the promise of IoT. AWS can provision large-scale compute and database services on demand. Test out how its EC2, RDS, Autoscale and Reserved Instances services work together to make web-scale cloud computing easier for developers, optimizing performance and capacity while keeping costs down. Are you looking to add IaaS to your offerings but don’t know where to start? This workshop will walk you through the steps of designing your own IaaS strategy, from building your team and solutions to identifying targeting customers, creating 12-month goals, and more. Service providers can get a demonstration of CloudBlue Connect to learn how to find and package complementary cloud products and see how its tools will help you improve and better manage your catalog of products. More than an update to Microsoft’s iconic suite of productivity software, Microsoft 365 is the answer to the question: “What will tomorrow’s business platform look like?” A complete, intelligent solution, including Office 365, Windows 10, and Enterprise Mobility + Security, that empowers everyone to be creative and work together, securely. Partners will learn how to build their businesses around a complete solution. Join the LG dedicated team for an informative and insightful roundtablediscussion as we take a look at Cloud through LGend points. *Open to public no registration required "
Purchasing technology resources has historically been the responsibility of the CIO or IT department. But the proliferation of SaaS services has created a new tech buyer: line of business influencers and departmental executives. Learn who these buyers are, their buying habits and how they can be a key growth opportunity. A majority of partners remain in the Build stage. Don’t get stuck there and learn what it takes to move your cloud business forward to the Breadth stage. Find out more about incorporating SaaS offerings, cross-selling, automated provisioning and digital marketing. Connect enables marketplace vendors to speed up time to market and grow new channels. Find out how you can quickly develop and test cloud solutions as well as integrate them into Cloud Marketplace for distribution, reducing overall costs and maximizing market reach. What does it take to become a thriving XaaS provider? Get insider’s guidance from our experts on market trends, portfolio building, GTM strategies, best practices and acceleration services that will propel you on the road to firm success in the cloud. IoT is more than an IT revolution – it’s a business revolution. Come learn from technology leaders how IoT is transforming organizations today and shaping the business world of tomorrow. Are you ready to incorporate IaaS sales into your business? Make sure your management and technical teams understand what cloud is and why it’s important. Create an education plan for 4 different personas on IaaS: the business leader, salesperson, pre-sales tech, and technical delivery/implementation. The most successful cloud partners are accelerating their cloud business through advanced IaaS solutions utilizing Azure. Ingram offers a 5-Pillar Program to launch and grow your Azure business, delivering consistent consumption revenue month-over-month. Join us to learn how to ACCELERATE with Azure. Learn how to build and maintain a successful marketing engine. By establishing a good foundation and leveraging 12 easy steps, you can maximize your marketing efforts and achieving your goals. Learn how to reach the Depth stage by becoming an end-to-end reseller and moving into the greatest untapped revenue potential: IaaS. We'll reveal how one of our top Azure partners in the US is accelerating their business through partnerships with Ingram Micro and Microsoft. Infrastructure as a service (IaaS) is the largest untapped opportunity for channel resellers. Learn what’s required for building a successful IaaS practice, such as identifying solutions and platforms, structuring talent, choosing value-added tools and resources, creating a services strategy, and more. Syndication is an exclusive program that enables service providers and ISVs to simplify and speed up deployment of services, expand and diversify service offerings, and lower operational costs. Find out how this premium program makes it easier to sell cloud services on the largest marketplace. Hybrid cloud solutions are expected to play a key role in digital transformation in 2019. Learn about the benefits of the various hybrid combinations (e.g., private and public, cloud and on-premises), IaaS and hyperscale options, the importance of bandwidth, and how partners can succeed in a hybrid environment. Vendors can get hands-on training for Connect to learn how to quickly integrate cloud offerings into the Cloud Marketplace. Vendors also will get a chance to step into the sandbox to see how you can develop and test cloud solutions. Microsoft Azure’s Functions let you build apps faster with an event-driven, serverless architecture. See how a Function is invoked by a trigger and executes a block of code or business logic to react to the event without the need to run a server or manually configure those reactions. An effective marketing plan plays a critical role in successfully selling IaaS. Build your own 12-month marketing plan for your IaaS business, with guidance on designing a compelling website, creating engaging social media, building traditional and digital campaigns, and more. Through the hype there are growth opportunities for partners with a strong understanding of how to leverage IoT solutions. Microsoft makes it easy with IoT services designed to integrate into existing business systems. Inbound marketing is THE way successful IT service providers are building relationships with clients. Explore marketing automation features important to service providers and learn how inbound marketing, lead nurturing and marketing automation is working for successful IT service providers. Microsoft partners come together to share insights with Microsoft leadership team on experiences building practices around Office 365 and Microsoft 365. *Only Microsoft CSPs may participate. Only 1% of partners have reached the Scale stage, yet they see 40% more pipeline than all the others. Learn about moving to this final stage by implementing self-service options for customers and outsourcing your catalog to the Ingram Micro Cloud Marketplace resulting in longevity and success. By 2020, global IaaS revenue will exceed $72 billion, Gartner predicts. MSPs who want a piece of that revenue need to build a profitable IaaS practice. Learn how to develop a successful IaaS practice by automating processes, complementing existing offerings with the cloud and more. CloudBlue Connect gives service providers access to the ever-growing CloudBlue platform to discover complementary products to package together. Find out how to expand market offerings while saving time and money with the easy onboarding of new solutions and deployment of connectors. Privacy is among today’s top digital concerns, as cyberattacks and data breaches regularly make news. Find out how regulatory privacy such as GDPR has helped or hurt cloud security, how data breaches are being tackled by new technology and laws, and how you can turn these issues into opportunity for your business. Incorporating IaaS into your offerings will set you apart from other channel partners. Develop the sales plan for your IaaS business, including how to build a sales cadence, run an assessment, create a proof of concept, create proposal templates, and sales commission advice. Learn how to increase your bottom line by selling Cisco Meraki and Umbrella! Microsoft partners come together to share insights with Microsoft leadership team on experiences building practices around Azure. *Only Microsoft CSPs may participate. Nearly a year ago, Renée introduced the Ingram Micro Cloud Awesomeness Roadmap and revealed the insights and tools necessary for success. You’ll see how the partners who are now following the roadmap are rapidly transforming their businesses. Plus, learn best practices at each of the four stages, and delve deeper into what it takes to be cloud awesome. Carl & Tim will talk about a number of topics that span Carl’s 30+ years of experience, starting from Carl’s upbringing to his professional journey to the impact of cloud. They will touch on mentorship, leadership, scaling companies and how to operate in a technology world that only seems to be accelerating due to the migration to the cloud. Digital transformation means something new every decade. This sort of constant change is stressful for any organization, but especially for the large enterprise. Because while nearly every enterprise began as a small, scrappy team, success means growth, and growth means accumulation—more technology, more processes, more people, and more red tape. As enterprise customers accelerate their hybrid cloud and modern application strategies, VMware Cloud, using the unique capabilities of AWS, empowers modern workloads with consistent infrastructure, operations, and reduced costs. In this session, learn how enterprises are using VMware Cloud on AWS for such use cases as cloud migrations, data center extension, next-generation applications, and app modernization. Sandy explores AWS Cloud and the value it delivers to customers and partners alike. She also gives an in-depth overview of VMware Cloud on AWS, the jointly engineered, hybrid cloud solution that enables easy enterprise workload migration. In addition, she’ll present several customer use cases. While people continue to talk about transformation, not everyone realizes it all starts with IoT. Ben addresses the need to focus on delivering business solutions that solve real business problems and explores how it leads to successful business outcomes when you use the right IoT services. But IoT is just the beginning. Sean dives into how AI aligns with IoT, explaining how businesses can take advantage of the AI opportunity with data as the fuel. “Building bridges by connecting Islands” In today’s business landscape, a company’s key differentiator has evolved from the most advanced product produced to the experience a company can create for its customer. It’s moments that are carefully curated for the customer from the first interaction through purchase that will now determine success for a business. Cisco is transforming the future of business, ensuring that the network of tomorrow is accessible today for Partners. By delivering solutions that support multiple business outcomes with a foundation built on an intent-based network that is designed for agility, automation, and assurance. We’re not only creating moments, but opportunities by supporting our partners to deliver an experience through innovation that creates loyal customers each and every day. Your customers are busy, and they have partnered with you to ease their workload. Why are you making it difficult for them to understand your value? Learn how to use data analytics to prove your value and improve customer retention with a few simple steps. Whether you are looking to transition from a reseller-based business to a cloud services provider or you just want to add more cloud services to your portfolio, transformation is about more than just adding annuity-based products to your line card. Learn some best practices for building a true cloud services consulting business. Delivering anything as a service (XaaS) is critical to any partner looking to stay competitive in the digital economy. CloudBlue can help you build, implement and launch a successful XaaS go-to-market strategy with more accuracy and speed. Find out how you can create and launch your own XaaS GTM strategy. Artificial intelligence (AI) and machine learning (ML) can help businesses improve operational efficiency, from automation to chatbots. Learn about the innovative uses of intelligent systems, how some industries are benefitting from them, and the concerns of transparency and trustworthiness. Amazon Virtual Private Cloud (VPC) allows you to provision a logically isolated section of the AWS Cloud where you can launch AWS resources in a virtual network that you define. Get a hands-on look at how to build a VPC on AWS so you can enjoy public cloud capabilities in a secure, closed environment. Only Citrix Workspace offers a user-centric experience where everything you need to work is in one unified app, with conditional access and performance made simple based on user context and IT-designed policies. Citrix Workspace fully aggregates all apps and data across all applications—both on-premises and cloud—to deliver the right experience to the right user at the right time. In this session, you will learn how Citrix Workspace is driving the future of work, and why it should be top of mind for you. Building a successful cloud practice requires partners to “wow” end-customers. Increasingly the way to differentiation is attaching profitable value through teamwork and security solutions. Microsoft will walk partners through opportunities to expand their cloud portfolios, increase their financial success and most importantly delight the customer. You're different from your competitors, but your prospects don’t know it. Why? Because you’re not positioning yourself the right way. Learn how to market yourself in a way that cannot be copied by your competitors and unlock more leads, more sales, higher margins, and better staff for your organization. Cross-selling is a proven way to boost profitability. Explore the benefits and best practices of it and learn about our new Cross-sell Calculator and how it can help you become a master cross-seller. Learn about some case studies of successful partners who have grown their stack using cross-selling. Ingram Micro’s new Sales and Marketing Hub is your destination to better connect with other partners in the ecosystem to increase the adoption of cloud services. Vendors can provide resellers with enablement and campaign assets, so resellers can easily discover and learn about products and access self-service marketing tools. Get a deeper look at CloudBlue’s features and services, such as cloud service brokerage in the marketplace, prebuilt marketing content, subscription management, customizable reports, automated tools, and user lifecycle management. Plus, see a demo of Cloud Marketplace’s new control panel, UX1. Business intelligence and data are key factors in good decision making. But research shows that most data isn’t being used effectively. Find out how organizations can more effectively mine data and use the insights to develop and improve strategies. VMware’s Cloud delivers what few other clouds can; consistent infrastructure and consistent operations. Learn how Ingram and VMware leverage VMC on AWS, VMware’s SaaS portfolio and our VMware Cloud Provider Program to accelerate your cloud practice. Do you keep falling short of your revenue goal? Are you overwhelmed in daily activities? Do you have to speak to too many people to get something done? If the answer is yes, then you need to balance your business. Learn how to create KPIs in each part of your business to identify where your problems are so you can solve them. Bredin CEO Stu Richards will present new research on how to engage SMBs, the tactics you can use to drive awareness and conversion most effectively, and the messaging that resonates with them. With Marketplace API, resellers can improve customer management and simplify the customer experience by integrating their own storefront, CRM and billing systems into the Ingram Micro Cloud Marketplace. Get a look at all the features of Marketplace API and how they can improve your business operations. IoT is generating new and profitable opportunities, such as smart home services and other smart devices. Find out how CloudBlue can leverage these opportunities to help you deliver value-based outcomes to your end-users and accelerate your monetization opportunities. Drones and robots (Robots as a Service) are helping SMBs gather intelligence, enhance operational efficiency, and expand offerings. This market is projected to reach $30B in just 5 years. Learn how these technologies can be quickly deployed for commercial use and the next market transition they offer for both end users and providers. Microsoft’s SQL Server 2008 will reach end of support this July. Get a demonstration on how to migrate from this legacy application to Azure. Avoid business disruptions, security risks, and compliance issues by preparing to update your systems now. Understanding how to optimize IaaS investments gives you an edge over other IaaS providers. Learn how to help your customers save on costs, define the right sizing, and meet security, governance, and compliance standards with CloudCheckr. Every business needs protection against online threats, but different workloads require different backup and disaster recovery solutions. Find out what you should look for to ensure you and your customers have the most secure backup and disaster recovery solutions to protect the business. Join Red Hat for an engaging discussion on how the market is evolving towards the cloud, and ready-to-deploy solutions that address specific customer challenges. Proactive partners who prepare for- and leverage these trends will be able to deliver even more value to their customers, by positioning Red Hat's technology stack in different ways to move up their customers value chain and sell into non-traditional lines of business. Come learn how Red Hat and Ingram are working with the major cloud providers to reduce friction, deliver greater flexibility and increase speed-to-market, all while helping you, as the trusted customer advisor, deliver greater value. Recruiting talent is key to business growth and competitive advantage, but how do you know who to hire next, and when? The solution lies in tying hiring decisions to objective planning metrics. Learn how to hire more confidently, manage operations and take control to increase business profitability. Provisioning can be tricky, but this session will provide some tips on how to navigate the process. Learn how to track and troubleshoot an order, how to address some of the most common issues, the extra steps needed when placing orders with certain vendors, how to find and view relevant information, and the basics of branding. Ingram Micro Cloud’s IaaS Lifecycle Services help partners capture new business and better serve customers. Panelists from Cloudamize, CloudCheckr, BlazeClan, and PlumChoice will share their experiences and best practices in incorporating these services into their businesses. Learn how Ingram Micro Cloud Orchestrator (IMCO), a multi-cloud orchestration platform, enables partners to quickly, easily, and securely deploy and manage workloads in a hybrid and multi-cloud environment. Blockchain isn’t well understood and not completely proven—yet. Cryptocurrency is forecast to grow, but blockchain is more than cryptocurrency. Learn about blockchain’s other applications, blockchain-inspired solutions and why it’s important to start thinking about blockchain now. Partners are leveraging the Acronis Data Cloud to secure their customers' business, bring down costs and maximize profits through additional services. Come and learn how. Window to the Cloud Through LG’s EndPoints will teach you why LG? Who from LG you can talk to for Cloud EndPoint sales, What products are offered by LG, and How those products can help make your customers work life better. 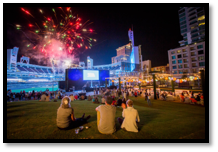 Closeout Cloud Summit 2019 at the Park inside Petco Park for a Final Night Party to remember. Food, fun, and a private fireworks showcase you'll never forget!